Dendritic cells (DC) are able to capture, process, and present exogenous Ag to CD8+ T lymphocytes through MHC class I, a process referred to as cross-presentation. In this study, we demonstrate that CD103+ (CD11chighCD11blow) and CD103− (CD11cintCD11bhigh) DC residing in the lung-draining bronchial lymph node (brLN) have evolved to acquire opposing functions in presenting innocuous inhaled Ag. Thus, under tolerogenic conditions, CD103− DC are specialized in presenting innocuous Ag to CD4+ T cells, whereas CD103+ DC, which do not express CD8α, are specialized in presenting Ag exclusively to CD8+ T cells. In CCR7-deficient but not in plt/plt mice, Ag-carrying CD103+ DC are largely absent in the brLN, although CD103+ DC are present in the lung of CCR7-deficient mice. As a consequence, adoptively transferred CD8+ T cells can be activated under tolerizing conditions in plt/plt but not in CCR7-deficient mice. These data reveal that CD103+ brLN DC are specialized in cross-presenting innocuous inhaled Ag in vivo. Because these cells are largely absent in CCR7−/− mice, our findings strongly suggest that brLN CD103+ DC are lung-derived and that expression of CCR7 is required for their migration from the lung into its draining lymph node. The MHC class II molecules load peptides derived from exogenous proteins that are acquired by endocytosis or from internalized plasma membrane proteins. In contrast, MHC class I molecules normally incorporate peptides derived from proteins synthesized in the cytosol (reviewed in Refs. 1 , 2). Thirty years ago, Bevan (3) reported that minor histocompatibility Ags could be transferred from cells to host APCs and, as a consequence, stimulate cytotoxic CD8+ T cell-mediated immune responses. This phenomenon was named “cross-priming” (3) and the processing of exogenous Ag for MHC class I presentation has been referred to as “cross-presentation” (reviewed in Ref. 2). For self-Ags, the CD8α+ dendritic cell (DC)3 subset has been identified for its capability to cross-present Ag to CD8+ T cells giving rise to two possible different outcomes: cross-priming or cross-tolerization (3, 4). Cross-tolerance implicates the induction of CD8+ T cell tolerance by cross-presentation of self-Ags; by contrast, cross-priming involves the activation of CD8+ T cells for the generation of CTL effector cells. It has been shown recently that the capacity of DC for cross-presenting Ags depends on their Ag-processing properties, suggesting that the CD8α+ DC subset has specialized machinery for cross-presenting self-Ags that is probably absent or less effective in other DC subsets (5). In contrast to the situation described for self-Ags, little is known about DC that cross-present innocuous inhaled Ag for cross-tolerization. A recent report has identified the CD103+ DC in mice as a major DC population residing in the lung mucosa (6). CD103 (αE) is the α-chain of the αEβ7 integrin, which has been reported to be essential for the adhesion of human and mice intestinal lymphocytes to epithelial cells through the interactions with E-cadherin (7). CD103+ DC in the lung do not express the typical plasmacytoid DC (B220, Gr-1) or lymphoid markers (CD8α), but express high amounts of CD11c, MHC class II, and low levels of CD11b (6). We have previously demonstrated that CCR7 expression plays a pivotal role for the mobilization of DC from the skin (8), the intestine (9), and the lung (10) to the respective draining lymph nodes (LN). This migration is indispensable for the immunological relevant transport of Ag to tolerize CD4+ T cells. Consequently, CCR7-deficient mice fail to induce tolerance toward ingested (9) or inhaled Ags (10). Based on these observations, we hypothesized that the impaired migration of lung-derived DC may also influence cross-presentation of innocuous Ag and the subsequent Ag-driven CD8+ T cell proliferation. In agreement with this concept, we now demonstrate that the adoptive transfer of OVA-loaded CCR7-deficient bone marrow-derived DC (BMDC) to C57BL/6 (B6) recipients, which also received CFSE-labeled OT-I cells, failed to induce proliferation of the adoptively transferred OT-I cells. Of interest, OT-I proliferation could be rescued when B6 BMDC were transferred intratracheally (i.t.) to CCR7-deficient recipients. Further analysis of this process revealed that Ag-carrying CD11chighCD11blowCD8α−CD103+ DC, present in the brLN of wild-type and plt/plt, but almost absent in CCR7-deficient mice, have evolved to acquire specialized functions for cross-priming innocuous Ag to CD8+ T cells under tolerogenic conditions. In contrast, CD11cintCD11bhighCD103− DC are specialized in presenting innocuous Ag to CD4+ T cells. CCR7-deficient mice (11) were backcrossed for eight generations to C57BL/6 mice. C57BL/6 Ly5.2 (CD45.2), plt/plt, OT-I Thy1.1, and OT-II Ly5.1 mice, which carry a transgenic TCR for the H2-Kb-restricted SIINFEKL peptide derived from OVA257–264 or for the H2-Ab-restricted ISQAVHAAHAEINEAGR peptide derived from OVA323–339, were also used in this study. All the mice strains were bred and maintained under specific pathogen-free conditions at the Central Animal Facility of Hannover Medical School (Hannover, Germany) or were purchased from Charles River Breeding Laboratories. All animal experiments were conducted in accordance with local and institutional guidelines. BMDC of wild-type and CCR7-deficient mice were generated as previously described (8). Briefly, bone marrow cells were harvested from femurs and tibiae and subsequently cultured in complete medium supplemented with 30 ng/ml GM-CSF. At day 3, culture medium was removed and the cells were selected by adherence. Four days later, cells were incubated for 24 h with 100 μg/ml OVA grade VI (Sigma-Aldrich) and 1 μg/ml LPS (Sigma-Aldrich). At day 8, BMDC were washed extensively with PBS and i.t. injected. Mice were anesthetized i.p. with 0.2 mg of ketamine and 0.02 mg of xylazine per gram of body weight. A blunt cannula (0.7 × 19 mm, Introcan; B. Braun) was gently introduced through the larynx into the trachea under visual control (Head-worn Loupe KS; Zeiss). A volume of 60 μl of extensively washed OVA-loaded BMDC or Cy5-labeled OVA (1 mg/ml in PBS) was i.t. injected. All batches of OVA were tested for the presence of LPS (LAL QCL 1000; BioWhittaker-Cambrex), and only batches containing <5 EU/mg were used. The thoracic cavity was dissected and the brLNs were exposed, isolated, and minced. DC were released from the brLNs by enzymatic digestion using RPMI 1640 containing 25 μg/ml DNase I (Roche), 10% FCS, 25 mM HEPES, and 500 μg/ml collagenase D (Roche) for 30 min at 37°C on an orbital shaker at 200 rpm. The cell suspension obtained was filtered using a nylon mesh. Finally, the cells were washed twice with PBS containing 2% FCS and 2 mM EDTA. The DC of brLNs were prepared following the protocol described. All the cell suspensions were preincubated with 2 μg/ml blocking anti-FcR (2.4G2) before staining to reduce nonspecific binding. The following mAbs were used: CD3 (17A2), CD4 (RMCD4-2), CD8β (RMCD8-2), CD8α (53-6.7), CD11b (M1/70.15), CD11c (HL3), CD205 (NLDC-145), and CD19 (1D3) were purified and labeled in our laboratory; CD2 (RM2-5), CD18 (C71/16), CD11a (I21/7), CD80 (16-10A1), CD86 (RMMP-1), CD49d (428), CD49e (5H10-27), PDL1 (MIH3), PDL2 (TY25), CD40 (3/23), rat isotype control (R35-95), MHC class II (IAb) (AF6-120.1), Ly6c (AL-21), Vα2 (B20.1), Vβ5 (MR9-4), and CD103 (M290) were purchased from BD Biosciences; 33D1 was obtained from eBioscience. Before i.t. transfer, BMDC differentiation was monitored applying mAbs to CD11c, IAb, and CD86. The brLN cell suspensions were stained with anti CD3, CD19, CD11c, and CD103 mAbs. Consequently, CD11c+CD103+OVA-Cy5+CD3−CD19− as well as CD11c+CD103−OVA-Cy5+CD3−CD19− DC were sorted on a FACSAria cell sorter (BD Biosciences). The purity of sorted DC was always >96%. Dead cells and debris were excluded by propidium iodide or DAPI (4′,6′-diamido-2-phenylindole hydrochloride) staining. Flow cytometry acquisition was conducted on a LSR-II cytometer (BD Biosciences) while data analysis was performed using WinList 5.0 (Verity Software House). Spleen and peripheral LN of OT-I Thy1.1 or OT-II Ly5.1 mice were minced through a nylon mesh. Cells were washed twice with PBS and adjusted according to the number of Vα2+Vβ5+ cells. A total of 5 × 107cells/ml were labeled with 5 μM CFSE (Molecular Probes) in PBS at 37°C for 10 min. The reaction was stopped by adding 2 volumes of cold RPMI 1640 containing 10% FCS followed by two washes in PBS. Each recipient received i.v. 15 × 106 OT-I T cells into the tail vein. In some experiments, mice were treated in an aerosol chamber with OVA aerosol (1% in water) or water alone. At 24 h after of adoptive transfer of CFSE-labeled cells, OVA solution or water was vaporized for 20 min using a PariBoy vaporizer as previously described (10). On day 4, mice were sacrificed and the brLN as well a nondraining LN were analyzed by flow cytometry to monitor the rate of T cell division. Mice i.v. received 60 μg of OVA-Cy5 in PBS in a total volume of 60 μl. The brLN were removed 24 h later and CD3−CD19−CD11c+OVA-Cy5+CD103+ DC or CD3−CD19−CD11c+OVA-Cy5+CD103− DC were isolated by flow sorting. DC (2000 cells) were seeded in U-bottom 96-well plate and cocultured with 15 × 104 OT-I or OT-II T cells. Proliferation of OT-I and OT-II T cells in triplicate wells was measured after 3 days by pulsing the cells with 1 μCi/well [methyl-3H]thymidine followed by further incubation for 16 h. Plates were harvested, and thymidine uptake was quantified in a beta counter (Microbeta TriLux; PerkinElmer). CD103 is expressed on 30–50% of the lung-derived CD11c+ DC migrating to the brLN (10). Thus, similar to the situation described for DC of the mesenteric LN (12) and lung (6), CD103+ and CD103− DC are present in the brLN of wild-type mice following i.t. instillation of 60 μg of Cy5-labeled OVA (Fig. 1⇓A). Of interest, CD11c was expressed differentially on these DC, being more abundantly present in the CD103+ DC (Fig. 1⇓A). Assessing the capacity for Ag uptake and presentation, CD103+ and CD103− DC were analyzed for the presence of OVA-Cy5+. OVA-Cy5 was found to be trapped with roughly equal efficiency by both CD103+ and CD103− DC (Fig. 1⇓B). Phenotypical characterization of Ag-bearing CD103+ and CD103− DC of the brLN. A, Cy5-labeled OVA was i.t. injected to wild-type mice, and 24 h later the brLN were dissected and digested with collagenase D-DNase I. The cell suspension was labeled with mAbs against CD11c, CD3, CD19, and CD103. CD11c+CD3−OVA-Cy5+CD19− DAPI-negative were sorted into CD103+ and CD103− DC. B, Uptake of soluble Cy5-labeled OVA Ag by CD103+ and CD103− DC in the brLN. Cells were gated on CD11c+CD103+ propidium iodide-negative (PI−) and CD11c+CD103− propidium iodide-negative stain and analyzed for the expression of OVA-Cy5. CD11c+OVA-Cy5+CD103+ and CD11c+OVA-Cy5+CD103− DC of the brLN were analyzed for the expression of surface markers. Interestingly, CD103+ DC expressed a low amount of the myeloid marker CD11b, whereas this marker was considerably brighter in CD103− DC. A reverse situation could be observed for marker CD11a (LFA-1), which was more abundantly expressed on CD103+ DC than in CD103− DC. Further analysis of expression levels of costimulatory (CD40, CD80, CD86, PD-L1, PD-L2, MHC class II) and adhesion molecules (CD18, CD49d, CD49e, CD2, CD54, CD102, CD106) failed to reveal any significant differences between the two subsets (Fig. 2⇓A). CD103+ and CD103− DC were also negative for B220, CD4, Ly6c (Fig. 2⇓A and data not shown) and CD8α (Fig. 2⇓B), indicating that neither CD103+ nor CD103− DC belong to the CD8α+ DC or plasmacytoid DC subset. CD11c+ DC isolated from spleen were used as positive controls because they contain subpopulations positive for CD8α or the 33D1 Ag (Fig. 2⇓B). 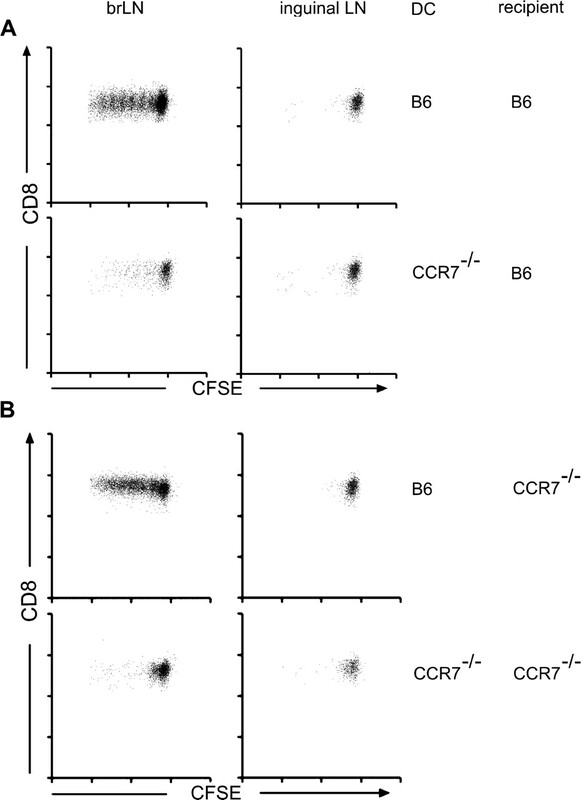 Of interest, DC isolated from the brLN were negative for CD8α as well as 33D1 (Fig. 2⇓B), but CD103+ and CD103− DC expressed CD205 to some degree (Fig. 2⇓C). CD103+ and CD103− DC in the brLN do not express markers characteristic for plasmacytoid DC or CD8α DC subsets. A, Cy5-labeled OVA was i.t. administered to wild-type mice and 24 h later cells were isolated from the brLN. Cell suspensions were prepared from collagenase D-DNase I digested brLN. DC from brLN were gated on CD11c+OVA-Cy5+CD103+ propidium iodide-negative (PI−) or CD11c+OVA-Cy5+CD103− propidium iodide-negative stain and analyzed for the expression of DC markers or costimulatory and adhesion molecules as indicated. 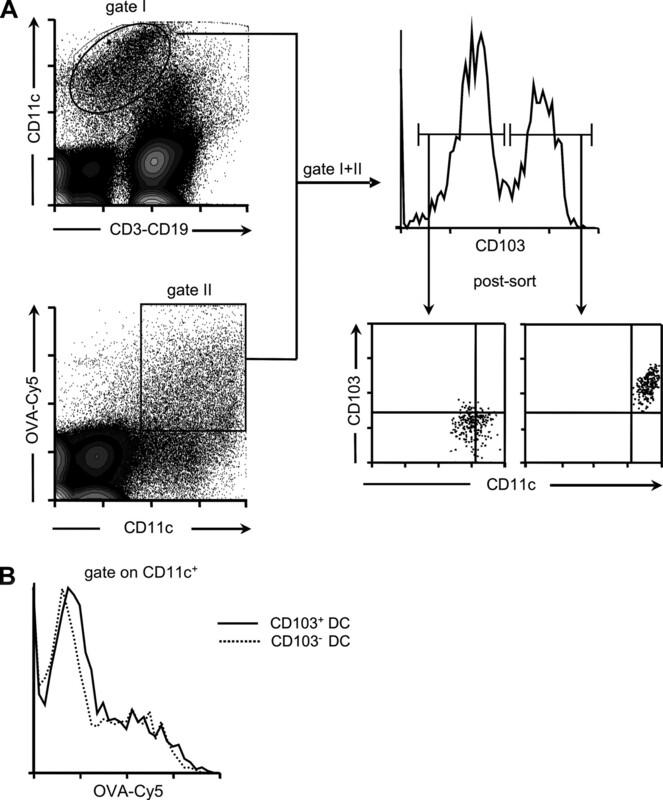 CD103+ DC (gray shaded histogram) and CD103− DC (open histogram) are shown. B, Expression of CD8α and 33D1 on CD11c+ from brLN (top panels) and spleen (bottom panels). Isotype control is shown by dotted line histogram. C, CD11c+OVA-Cy5+CD103+ or CD11c+OVA-Cy5+CD103− DC from brLN were analyzed for the expression of CD205 (top panels). Spleen cells from untreated wild-type mice were gated on CD11c+CD103+ or CD11c+CD103− and analyzed for the expression of CD205 (bottom panels). Isotype control is shown by dotted line histogram. Besides the presentation of pathogen-derived Ags, airway DC are also capable of presenting inhaled innocuous Ags to T cells to induce tolerance. We therefore aimed to determine whether different airway DC subsets have evolved to become specialized in presenting harmless Ag to distinct T cell subsets. To that end, OVA-Cy5 was i.t. instilled in wild-type mice. After 24 h, CD11c+OVA-Cy5+CD103+ and CD11c+OVA-Cy5+CD103− DC were isolated by flow sorting from the brLN and cocultured in vitro with OT-I or OT-II T cells for 72 h before T cell proliferation was assessed by [3H]thymidine incorporation. Strikingly, CD103+ and CD103− DC displayed distinct capabilities in priming CD4+ or CD8+ T cells. Thus, OVA-Cy5+CD103+ DC efficiently cross-presented the OVA Ag to CD8+ T cells, whereas OVA-Cy5+CD103− DC almost lacked such stimulatory activity (Fig. 3⇓A). 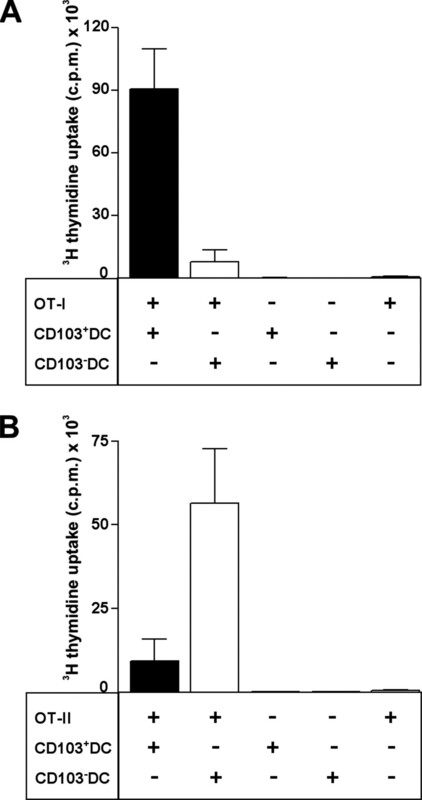 Conversely, CD103− DC induced massive proliferation of CD4+ OT-II, but not CD8+ OT-I T cells (Fig. 3⇓B). Although both CD103+ and CD103− DC exhibited similar competency in taking up innocuous Ag (Fig. 1⇑B), these DC process and present Ag differently to CD4+ and CD8+ T cells. CD103− and CD103+ brLN DC are specialized in presenting and cross-presenting innocuous Ag. CD11c+OVA-Cy5+CD103+ (▪) and CD11c+OVA-Cy5+CD103− (□) DC were flow-sorted from the brLN of wild-type animals following 24 h after i.t. instillation of Cy5-labeled OVA. CD103+ or CD103− DC (2000/well) were cocultured with 15 × 104 OT-I (A) or OT-II (B) T cells in triplicate as indicated. Three days later, cultures were pulsed with 1 μCi/well [3H]thymidine for 16 h before thymidine uptake was quantified. Data are mean ± SD for n = 3 independent experiments. Because OVA-Cy5+CD103+ DC in wild-type animals are specialized in cross-presenting innocuous Ag, we were interested in assessing the presence of this cell population in the brLN of CCR7-deficient and plt/plt mice. The latter mouse strain represents a naturally occurring mutant that lacks expression of CCR7 ligands in LN but not in nonlymphoid organs such as the lung. We determined the percentage of CD11c+OVA-Cy5+CD103+ DC in collagenase-digested brLN of wild-type, CCR7-deficient, as well as plt/plt mice 24 h after i.t. instillation of OVA-Cy5. As depicted in Fig. 4⇓A, we failed to observe any significant differences between wild-type and plt/plt mice regarding the frequency of OVA-loaded CD103+ DC. In contrast, the frequency of this cell population was severely reduced in CCR7−/− mice. Together with data published earlier (10), this observation suggests that the migration of CD103+ DC from the lung to the brLN depends on CCR7 expression on lung-residing DC. Because plt/plt mice still express the CCL21-leu gene in lymphatic endothelial cells of the lung, it seems likely that CCL21-Leu allows for the migration of CD103+ DC from the lung to its draining LN in this mouse strain. OVA-Cy5-loaded CD11c+CD103+ DC cross-present the OVA Ag to the same extent in plt/plt mice as in wild-type mice. A, The percentage of CD11c+OVA-Cy5+CD103+ DC of all cells present in brLN of wild-type (n = 11 animals) (□), plt/plt (n = 6 animals) (▪), and CCR7-deficient (n = 5 animals) (▩) mice was analyzed 24 h after i.t. instillation of OVA-Cy5 (mean ± SD). n.s., Not significant. ∗, p < 0.05. CD11c+OVA-Cy5+CD103+ and CD11c+OVA-Cy5+CD103− DC were flow-sorted from the brLN of wild-type and plt/plt mice 24 h after i.t. instillation of OVA-Cy5. As indicated, CD103+ or CD103− DC (2000 per well) were cocultured in triplicates with 15 × 104 OT-I (B) or OT-II (C) T cells for 3 days before they were pulsed with [3H]thymidine for 16 h. Proliferation was analyzed applying a beta counter. Data are mean ± SD with results from one experiment. Similar results were obtained in a second experiment. We next sorted CD11c+OVA-Cy5+CD103+ DC and CD11c+OVA-Cy5+CD103− DC from the brLN of wild-type and plt/plt mice 24 h after i.t. instillation of Cy5-labeled OVA. As in wild-type animals, only CD103+ but not CD103− DC from plt/plt mice efficiently cross-presented the OVA Ag to CD8+ T cells in vitro (Fig. 4⇑B). Likewise, CD11c+OVA-Cy5+CD103− DC from plt/plt preferentially stimulated the proliferation of CD4+ T cells (Fig. 4⇑C). In contrast to plt/plt and wild-type mice, CCR7-deficient mice displayed a pronounced impaired migration of CD103+ DC from the lung to the brLN and consequently they were largely absent in this lymphoid compartment (10). For this reason, the described experiment could not be performed using brLN DC of CCR7-deficient animals. However, as outlined in the following sections, the role of brLN DC in T cell proliferation could be addressed in CCR7-deficient mice in vivo. We subsequently compared the in vivo capacity of DC to cross-present inhaled Ag. To that end, wild-type, plt/plt, and CCR7-deficient mice were i.v. injected with CFSE-labeled OT-I T cells and 1 day later received an OVA aerosol. After an additional 4 days, the lung-draining LN was removed and analyzed. In wild-type and plt/plt mice, OVA-aerosol treatment induced Ag-specific proliferation of OT-I T cells, whereas Ag-induced proliferation was not detectable at all in CCR7-deficient mice (Fig. 5⇓). Together with the previously reported data (10), these results strongly suggest that the lack of CCR7 prevents the migration of DC from the lung to the draining brLN and, because of that, CCR7-deficient mice fail to present and cross-present Ag within the brLN to OT-II and OT-I T cells, respectively. CCR7-deficient mice are deficient, whereas plt/plt mice are proficient in cross-presenting inhaled Ag. CFSE-labeled OT-I cells were adoptively transferred into wild-type, plt/plt, or CCR7-deficient recipients. Subsequently, mice received an OVA or a control (water) aerosol. After 4 days, the proliferation of Vα2+CD8+ brLN T cells of mice that received the OVA (left) and water (right) was analyzed. Data are representative of two experiments with two to three mice each per experiment. To test this hypothesis, mature OVA-loaded BMDC from wild-type or CCR7-deficient mice were i.t. instilled into wild-type or CCR7-deficient recipients that adoptively received CFSE-labeled OT-I T cells 1 day earlier. As expected, OVA-loaded wild-type DC induced a strong proliferation of the OT-I T cells in the draining brLN of wild-type (Fig. 6⇓A, top panels) and CCR7-deficient (Fig. 6⇓B, top panels) mice. In contrast, OVA-loaded CCR7-deficient DC i.t. instilled in wild-type (Fig. 6⇓A, bottom panels) or CCR7-deficient (Fig. 6⇓B, bottom panels) mice failed to induce significant proliferation of OT-I T cells. Under neither condition was the proliferation of cells in the nondraining inguinal LN observed (Fig. 6⇓). The i.t. instilled CCR7-deficient OVA-loaded BMDC fail to induce CD8+ T cell proliferation in the brLN under tolerogenic conditions. As indicated, BMDC from wild-type or CCR7-deficient mice were loaded with OVA protein during maturation and i.t. instilled into wild-type (A) or CCR7-deficient (B) mice that had adoptively received CFSE-labeled OT-I cells 24 h earlier. Three days after DC instillation, the proliferation of the adoptively transferred Vα2+CD8+ T cells was analyzed in the lung-draining brLN or the nondraining inguinal LN. Representative results are shown for two to seven mice per group. The rapid mobilization of maturing DC from the site of Ag encounter to the draining lymphoid tissue is a critical event for the rapid initiation of adaptive immune responses (13, 14, 15, 16). Chemokines and chemokine receptors have been identified as essential players regulating DC mobilization and migration (8, 11, 17, 18). In particular, upon maturation, DC up-regulate the expression of CCR7 and become responsive to CCL19 and CCL21 (19). Consequently, CCR7 expression is essential for the mobilization of DC from the skin (8), the intestine (9, 12), and the lung (10) to the respective draining LN to induce tolerance. As a result of this impaired DC migration, CCR7-deficient mice fail to induce tolerance toward ingested (9) or inhaled Ags (10). In this study, we demonstrate that under tolerogenic conditions, expression of CD103 distinguishes two DC subsets that differentially prime CD4+ or CD8+ T cells in the lung-draining LN. The lung of wild-type and CCR7-deficient mice contain CD103+ DC that are reduced in the brLN of CCR7-deficient mice compared with wild-type mice (6, 10). CCR7-deficient mice also show a reduced number of these DC in skin-draining LN (data not shown) and in the mesenteric LN (12), suggesting that, in general, immature DC residing between epithelia might require CCR7 expression for proper mobilization from the periphery to the draining LN. In contrast to CCR7-deficient mice, the percentage of Ag-carrying CD103+ DC is not significantly reduced in the brLN of plt/plt mice. Although this mutant lacks expression of CCR7 ligands in lymphoid organs, one isoform of CCL21 (CCL21-Leu) is still present in these mice in nonlymphoid organs such as the lung, particularly in the endothelium of the afferent lymphatics (20). Therefore, it seems conceivable that expression of CCL21-Leu on afferent lymphatic vessels in the lung of plt/plt mice is sufficient to allow for steady state migration of DC to the brLN in these mice. Based on the differential expression of CD103, this study demonstrates the existence of two distinct DC subsets that have evolved different capabilities in priming CD8+ or CD4+ T cells in the brLN under tolerogenic conditions. In addition to CD103, these two DC subsets also express different levels of α-integrins such as CD11a, CD11b, and CD11c. However, these subsets were indistinguishable regarding the expression of costimulatory molecules or any of the other markers tested in this study. Despite the fact that CD103+ and CD103− DC express similar amounts of costimulatory molecules, their interaction with T cells leads to largely opposing outcomes. CD103+ DC primarily cross-present Ag to CD8+ T cells, whereas CD103− DC prime CD4+ T cells in both wild-type and plt/plt mice, but not in CCR7-deficient animals. The distinct capabilities of the CD103 DC subsets to prime T cells seems not to be related to their ability to take up Ag because both DC subsets capture comparable amounts of OVA following i.t. instillation. Along this line, it has been recently shown that spleen-derived CD8α+ and CD8α− DC engulfed similar amounts of Ag, yet within the spleen, only the CD8α+ DC subset is able to cross-present Ag to CD8+ T cells, whereas the CD8α− DC more efficiently stimulates CD4+ T cell proliferation (5, 21). Furthermore, during the submission process of this report Dudziak et al. (22) reported that, within the spleen, only CD205+ DC are able to cross-present Ag, whereas another DC population, negative for CD8α but positive for the 33D1 Ag, is specialized for presentation on MHC class II. Of interest, this study could show that the ability to present or cross-present Ag is intrinsic to the DC subsets and this role is associated with increased expression of components of the MHC class II and MHC class I processing pathways, respectively. Remarkably, the CD8α+ DC subset is largely absent in nonlymphoid tissues, such as skin (23), pancreas (24), stomach (25), and lung (26), and its contribution to the pool of migrating DC from the lung to the brLN seems to be of negligible relevance (10, 26, 27). Data provided in this study support this idea because CD103+ DC that cross-present Ag in the brLN lack CD8α expression. Along this line, the present study reveals that none of markers successfully used to discriminate presenting (33D1+) from cross-presenting (CD8α+, CD205+) DC in the spleen can be used in the lung-draining brLN. Steady-state DC isolated from this lymphoid organ lack expression of CD8α as well as 33D1, and both the CD103+ as well as the CD103− DC weakly express CD205. It is noteworthy to mention that several reports have recently suggested that CD103+ and CD103− DC isolated from the lung or the intestine might exhibit similar competence in stimulating OVA-specific CD4+ and CD8+ T cells (6, 12, 28). However, those studies were performed pulsing CD103+ and CD103− DC in vitro with OVA peptides. Applying this procedure, peptides are directly loaded to the MHC molecules from outside, circumventing the need for Ag uptake, processing, and presentation. In contrast, in the present study DC were loaded in vivo by i.t. application of the entire OVA protein. Together, these data suggest that both CD103+ and CD103− DC can present Ag to CD4+ as well as CD8+ T cells as long as the appropriate peptides gain access to the MHC groove. Because CD103+ and CD103− brLN DC serve opposing functions with regard to presentation and cross-presentation of exogenous Ag once loaded in vivo, it seems likely that both cell types may exhibit profound differences regarding Ag processing as recently described for CD205+ and 33D1+ DC of the spleen (22). In summary, our data reveal that Ag-carrying CD103+ brLN DC are specialized in cross-presenting innocuous inhaled Ag. 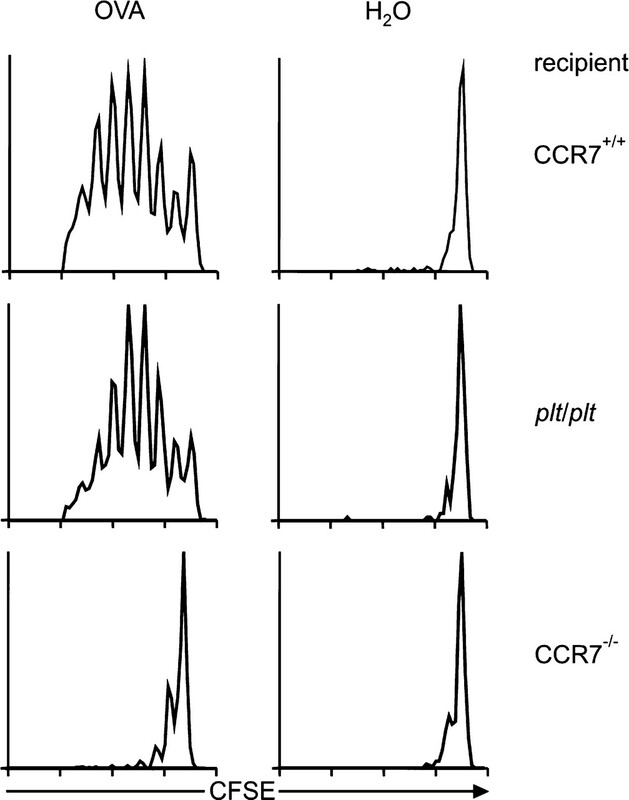 Because these cells are largely absent in CCR7-deficient but not plt/plt mice, our data strongly suggest that brLN CD103+ DC are lung derived and that expression of CCR7 is required for their migration from the lung into its draining LN. We are grateful in particular to Günter Bernhardt and Oliver Pabst for valuable suggestions on the manuscript, Matthias Ballmaier and Christina Reiner for cell sorting, and Jasmin Bölter for expert technical assistance. ↵1 This work was supported by a Grant SFB587-B3 from the German Research Foundation (to R.F.). ↵3 Abbreviations used in this paper: DC, dendritic cell; BMDC, bone marrow-derived DC; LN, lymph node; brLN, bronchial LN; i.t., intratracheal(ly). Shen, L., K. L. Rock. 2006. Priming of T cells by exogenous antigen cross-presented on MHC class I molecules. Curr. Opin. Immunol. 18: 85-91. Heath, W. R., F. R. Carbone. 2001. Cross-presentation, dendritic cells, tolerance and immunity. Annu. Rev. Immunol. 19: 47-64. Bevan, M. J.. 1976. Cross-priming for a secondary cytotoxic response to minor H antigens with H-2 congenic cells which do not cross-react in the cytotoxic assay. J. Exp. Med. 143: 1283-1288. Heath, W. R., C. Kurts, J. F. Miller, F. R. Carbone. 1998. Cross-tolerance: a pathway for inducing tolerance to peripheral tissue antigens. J. Exp. Med. 187: 1549-1553. Sung, S. S., S. M. Fu, C. E. Rose, Jr, F. Gaskin, S.-T. Ju, S. R. Beaty. 2006. A major lung CD103 (αE)-β7 integrin-positive epithelial dendritic cell population expressing Langerin and tight junction proteins. J. Immunol. 176: 2161-2172. Cepek, K. L., S. K. Shaw, C. M. Parker, G. J. Russell, J. S. Morrow, D. L. Rimm, M. B. Brenner. 1994. Adhesion between epithelial cells and T lymphocytes mediated by E-cadherin and the αEβ7 integrin. Nature 372: 190-193. Ohl, L., M. Mohaupt, N. Czeloth, G. Hintzen, Z. Kiafard, J. Zwirner, T. Blankenstein, G. Henning, R. Förster. 2004. CCR7 governs skin dendritic cell migration under inflammatory and steady-state conditions. Immunity 21: 279-288. Worbs, T., U. Bode, S. Yan, M. W. Hoffmann, G. Hintzen, G. Bernhardt, R. Förster, O. Pabst. 2006. Oral tolerance originates in the intestinal immune system and relies on antigen carriage by dendritic cells. J. Exp. Med. 203: 519-527. Hintzen, G., L. Ohl, M. L. Del Rio, J. I. Rodriguez-Barbosa, O. Pabst, J. R. Kocks, J. Krege, S. Hardtke, R. Förster. 2006. Induction of tolerance to innocuous inhaled antigen relies on a CCR7-dependent dendritic cell-mediated antigen transport to the bronchial lymph node. J. Immunol. 177: 7346-7354. Förster, R., A. Schubel, D. Breitfeld, E. Kremmer, I. Renner-Müller, E. Wolf, M. Lipp. 1999. CCR7 coordinates the primary immune response by establishing functional microenvironments in secondary lymphoid organs. Cell 99: 23-33. Johansson-Lindbom, B., M. Svensson, O. Pabst, C. Palmqvist, G. Marquez, R. Förster, W. W. Agace. 2005. Functional specialization of gut CD103+ dendritic cells in the regulation of tissue-selective T cell homing. J. Exp. Med. 202: 1063-1073. Dieu, M. C., B. Vanbervliet, A. Vicari, J. M. Bridon, E. Oldham, S. Çît-Yahia, F. BriÇùre, A. Zlotnik, S. Lebecque, C. Caux. 1998. Selective recruitment of immature and mature dendritic cells by distinct chemokines expressed in different anatomic sites. J. Exp. Med. 188: 373-386. Lin, C. L., R. M. Suri, R. A. Rahdon, J. M. Austyn, J. A. Roake. 1998. Dendritic cell chemotaxis and transendothelial migration are induced by distinct chemokines and are regulated on maturation. Eur. J. Immunol. 28: 4114-4122. Cyster, J. G.. 1999. Chemokines and cell migration in secondary lymphoid organs. Science 286: 2098-2102. Nakano, H., M. D. Gunn. 2001. Gene duplications at the chemokine locus on mouse chromosome 4: multiple strain-specific haplotypes and the deletion of secondary lymphoid-organ chemokine and EBI-1 ligand chemokine genes in the plt mutation. J. Immunol. 166: 361-369. Dudziak, D., A. O. Kamphorst, G. F. Heidkamp, V. R. Buchholz, C. Trumpfheller, S. Yamazaki, C. Cheong, K. Liu, H.-W. Lee, C. G. Park, et al 2007. Differential antigen processing by dendritic cell subsets in vivo. Science 315: 107-111. Allan, R. S., C. M. Smith, G. T. Belz, A. L. van Lint, L. M. Wakim, W. R. Heath, F. R. Carbone. 2003. Epidermal viral immunity induced by CD8α+ dendritic cells but not by Langerhans cells. Science 301: 1925-1928. Turley, S., L. Poirot, M. Hattori, C. Benoist, D. Mathis. 2003. Physiological β cell death triggers priming of self-reactive T cells by dendritic cells in a type-1 diabetes model. J. Exp. Med. 198: 1527-1537. Scheinecker, C., R. McHugh, E. M. Shevach, R. N. Germain. 2002. Constitutive presentation of a natural tissue autoantigen exclusively by dendritic cells in the draining lymph node. J. Exp. Med. 196: 1079-1090. Vermaelen, K. Y., I. Carro-Muino, B. N. Lambrecht, R. A. Pauwels. 2000. Specific migratory dendritic cells rapidly transport antigen from the airways to the thoracic lymph nodes. J. Exp. Med. 193: 51-60. Belz, G. T., C. M. Smith, L. Kleinert, P. Reading, A. Brooks, K. Shortman, F. R. Carbone, W. R. Heath. 2004. Distinct migrating and nonmigrating dendritic cell populations are involved in MHC class I-restricted antigen presentation after lung infection with virus. Proc. Natl. Acad. Sci. USA 101: 8670-8675.